This turkey and white bean chili is the idea comfort food. This is a recipe for a lighter chili that is made with ground turkey and white beans. Turkey and white bean chili is healthy comfort food at its best, which I don’t know about you, but I am seriously craving comfort food right now. There is just something about January that is rather, um, depressing. The holidays are over but it’s still freezing outside, I’m ready for summer already, ha. How’s January treating you so far? All I have to say is that it is positively sub-zero freezing in Toronto. Like I said, I’ve been craving comfort foods like crazy, and this healthy Turkey and White Bean Chili has been keeping me warm. My mom, who doesn’t really like chili very much is in love with this recipe, she says it’s the best chili she’s ever had. I’ll take it. I think that’s a pretty good sales pitch for this simple recipe. On another note, there is something that I’ve been struggling with recently. The fact is it’s difficult to understand that not everyone is going to like you. It’s kind of a hard thing to learn because a lot of the time, it feels like someone might not like you for no reason at all. You kind of pick your brain to pinpoint exactly what it is. Is it because I talk too much, or too little? Is it because I’m different? Is it because of my blog? Or that I laugh at my own jokes? While those are all somewhat silly things, I think it boils down to wanting to feel accepted, respected and appreciated. Which are all inherently human things. Don’t you think? It’s kind of like a recipe, not everyone is going to like this turkey and white bean chili because everyone has different tastes. Someone might prefer a slow cooker chili or a vegetarian option. While I think this turkey option is fantastic (which is why I’m posting it), Joe down the street might prefer something a little spicier. I think it’s important to just accept it and move on. It’s easier to do with a recipe than with yourself, but I’m trying to apply this thinking to my everyday life. I’m trying to spend my time with people I love and that lift me up and make me feel happy, instead of with people who make me question myself and what I do and who I am. Spending time with these good and wonderful people is exactly what I’ve been doing all weekend. I don’t think I’ve ever laughed as much as I did on Friday night, and it feels good. I think this might be my first big revelation of my 20s, folks, expect many more in the coming years. Side note, why does everyone hate on Anne Hathaway all the time? I think she’s awesome. Anyways, back to this simple weeknight dinner recipe. My mom's favourite Turkey and White Bean Chili! Add garlic and green pepper, cook for another 2-4 minutes. Add ground turkey, crumble and cook for 5-7 minutes, or until fully cooked. Add spices and pickled jalapenos. Cook for another minute. Add tomatoes and broth, using a wooden spoon to break up the tomatoes if necessary. Bring to a boil. Reduce to a simmer and cover. Cook for 10 minutes. 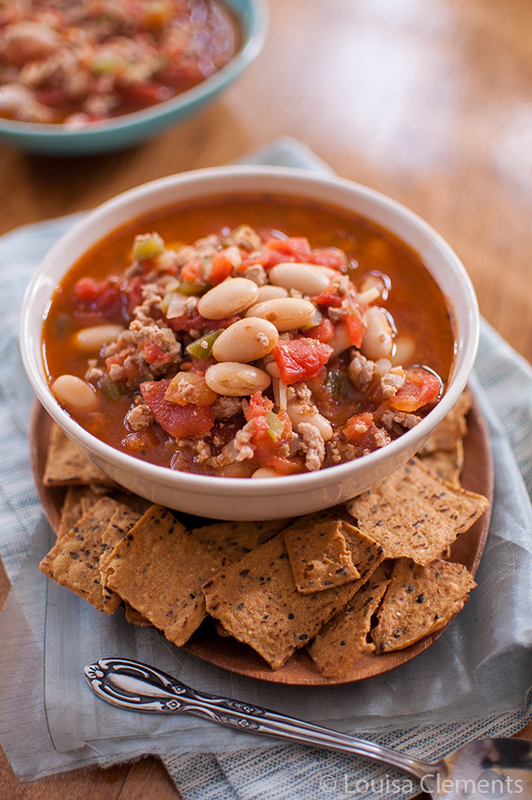 Warm your body with this healthy recipe for turkey and white bean chili. This soup looks amazing-I love soup this time of year. Are those spicy soy chips from Trader Joe's by any chance? If so, I loooove those. PS-your photos are amazing! Thank you, Erin, I really appreciate the kind words! No they aren't the spicy soy chips (which sounds AMAZING), they are actually the 3-seed sweet potato chips from RW Garcia. This is definitely my kind of chili! I bet it's super cold up in Canada. Here in California it is practically warm out. Today it was 68 degrees. Spoiled us, right? Great attitude about knowing not everyone is going to love your stuff. Feels freeing, doesn't it?I'm so glad you commented on my blog because now I've found your blog! So beautiful, and your recipes look amazing. Can't wait to see what you cook up next! Thanks, Rhonda! I'm so glad to know you too, you always make me smile! :)I'm so glad you shared your thoughts with me on this, it's really comforting to know that it's OK - even though I wish there was a magic formula! I'm really trying to do as you said; surround myself with the right people. This chili looks so great! 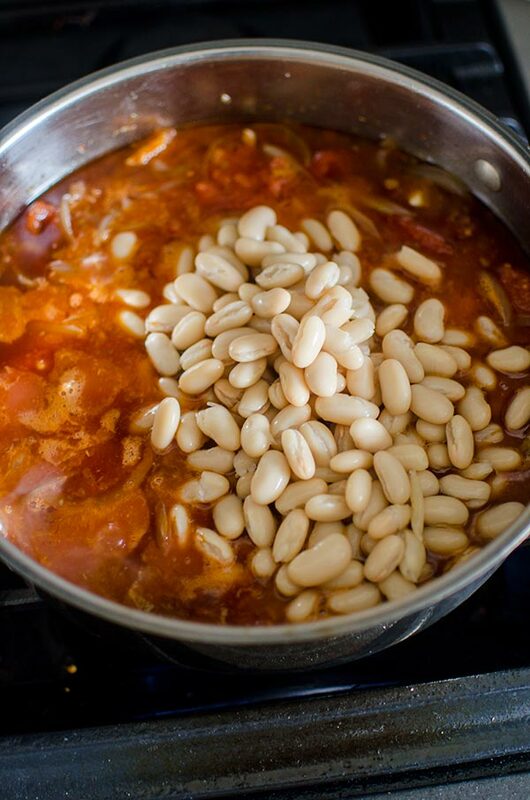 I love white beans so seeing them in this recipe makes me ultra happy! Gotta try this for dinner soon. Thanks, Pamela! Let me know if you give it a try.